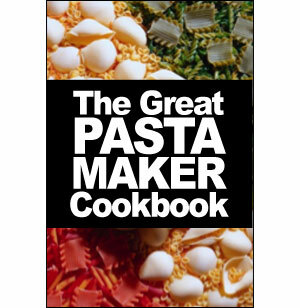 The Great Pasta Maker Cookbook is an exciting collection of fresh, healthy and easy-to-make pasta recipes. Nobody knows when the first pasta was made, but it is certainly one of the world's oldest foods. Noodle makers around the world knead, roll, tear, cut and twist dough into forms as plain as flat and rectangular and as complicated as cappelletti. The choice of toppings includes sweet or spicy sauces of every imaginable description. Pasta is really very nutritious, and it doesn't have to be fattening. High in complex carbohydrates and low in fat, a typical serving of pasta offers 10 to 30 percent of the minimum daily requirements of several important vitamins and minerals. It also provides a surprising amount of protein. Since you can make it so many ways, pasta is for everyone!